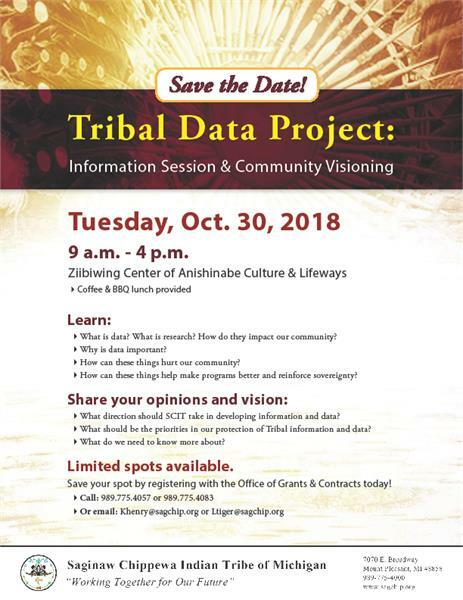 Tribal Administration would like to invite Community Members & Tribal Employees to learn about the Saginaw Chippewa Tribe’s recent efforts to protect and improve our Tribal data. Employees may attend with supervisor approval. The Data Project seeks to improve the quality and kinds of data gathered, the way that data is managed and stored, strategies for data sharing to improve programs and services for our community, and especially the ways we protect sensitive information about our community. Data protection is a sovereignty issue. In recent years, Tribal Nations across the country have launched efforts to protect data as a measure to protect Tribal citizens. We need YOUR help identifying data priorities, and visioning for the future!